During your Cambodia tours, you should not miss chance to visit pagodas and temples here which is always associated with Khmer life. 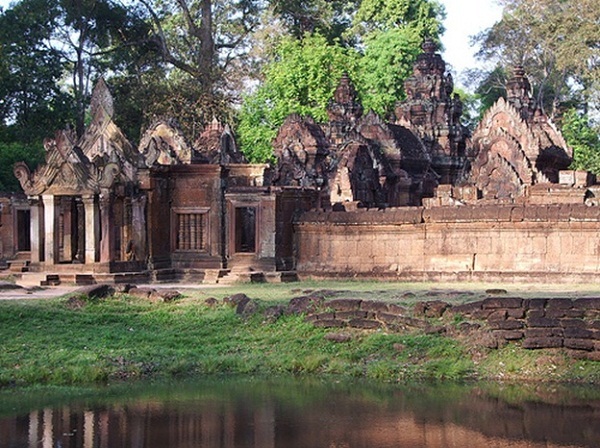 And Banteay Srei Temple should be one of your destinations in this country. Located in Angkor area, Banteay Srei Temple isabout 23 miles from the north of Angkor Wat. The temple consists of low walls surrounding peaked structures of deep red sandstone. Banteay Srei means “Citadel of Women”. It is said that the reliefs on this temple are so delicate that they could only have been carved by the hand of a woman. The well-preserved relief carvings on the central buildings depict scenes from ancient Hindu tales. Banteay Srei’s style is a mix of the archaic and the innovative; built largely of red sandstone with brick and laterite only for the enclosure walls and some structural elements. 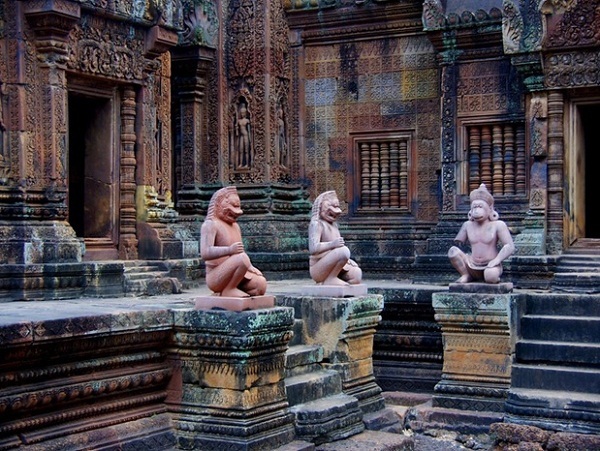 Although Banteay Srei’s coloration is unique, sandstone of other shades was later to become the norm. 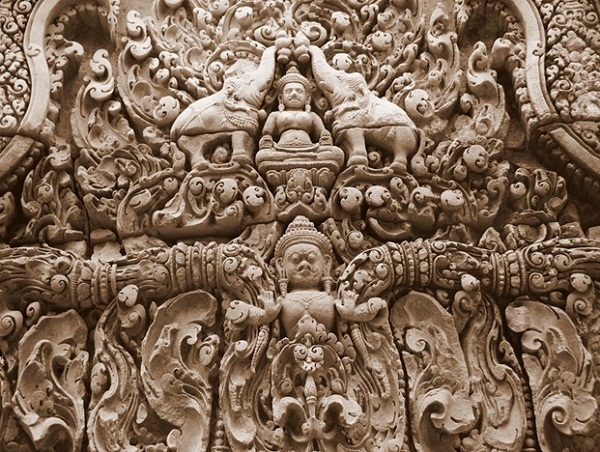 These distinct sculptures are one of the highlights of visiting Banteay Srei Temple. 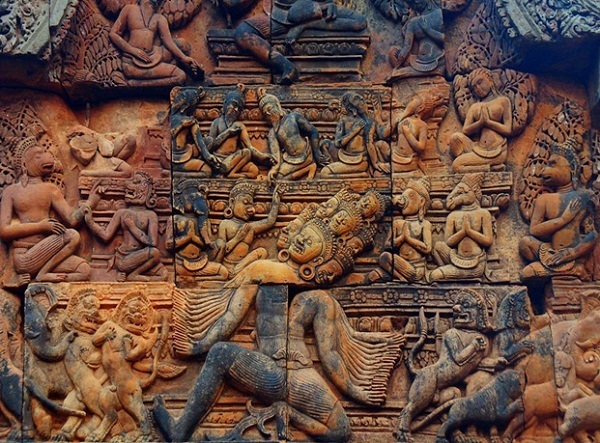 The intricate design and bas-relief carvings in Banteay Srei really set it apart from the other temples of Angkor. Another interesting little fact about Banteay Srei is that this temple was not commissioned by a king, rather by a Brahman who was a tutor to the royal family going to show just how much power he held. The unanimous opinion amongst French archaeologists who worked at Angkor is that Banteay Srei is a ‘precious gem’ and a ‘jewel in Khmer art’. In the past, the locals said Brahmin of royal descent, the spiritual teacher to Jayavarman VBanteay Srei, named Banteay Srei “Isvarapura”, according to inscriptions. It was by a . Some describe it a s being closer in architecture and decoration to Indian models than any other temple at Angkor. A special feature of the exquisite decoration was the use of a hard pink sandstone (quartz arenite) where enabled the ‘technique of sandalwood carving with even an Indian scent to it. If you want to study and explore Khmer culture, Banteay Srei Temple will be surely an appropriate choice for you.